Sharing computer chip collecting can be a challenge with non-tech people. Art is often a way for people, even if they don’t speak the same language, to have a common experience. ChipScapes started from that idea. I developed ChipScapesTM as a point to begin talking with others about computer chips. Vintage computer chips make very interesting art subjects. 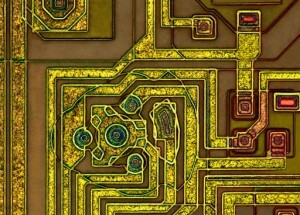 ChipScapesTM are pictures taken of computer chips, sort of microscopic chip landscapes, or ChipScapesTM for short. The colors come from the prism effect created by the lighting and the layered manufacturing process of computer chips. Check out my ChipScapesTM site: http://www.chipscapes.com/, or my eBay store: ChipScapes, or just enjoy some of my art below. ChipScapesTM are a great way to display your chips, and they make a great gift for that tech savvy person in your life. Quilt – 2009 (canvas artwork, 21″x21″): My family visited the Amish country in Pennsylvania a few years ago. The Amish are well known for their quilts. We saw many fine examples of this labor intensive calling. The patchwork style gives way to a very harmonious system of colors and shapes, and I loved the earthy colors. Traditional quilts are made from the plain clothing of Amish clothing. The idea of finding the art in the common and everyday is something that resonates with me. 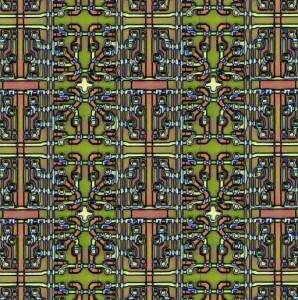 As I was creating this artwork, the patterns in this memory chip immediately reminded me of those quilts. Once a bit is latched into a SRAM memory cell, they use transistors to pass the bit around and around in the cell until it is needed. This particular SRAM could hold about 1,000 bits, so, there was a lot of commotion going on in the chip. Later they developed a much more passive and less power hungry way of storing data. Crop Circle – 2009 (canvas artwork, 35″x21″): The subject of this artwork is an unusual structure I found on chip. Most of the chip has the “normal” straight lines and right angle traces. So when I saw this crazy design in this field of traces, I though, “Aliens, Crop Circles!”. I believe it has some sort of electric charge storage function, but I haven’t seen anything like it before. Chips traces are “wiring” of chips. Traces are used to connect the various devices (like transistors, resistors, capacitors, inductors, etc.) on a chip together. Traces can run vertically and horizontally, but not at the same time, at least on the same layers. Layers on a chip are separated by laying down a super thin layer of SiO2, which is more commonly known as glass. Early chips had only a few layers and because the layers are separated with glass, it is easy to see down into the chip and see and the layers. Early traces have lots of imperfections give this artwork an antiqued feel. 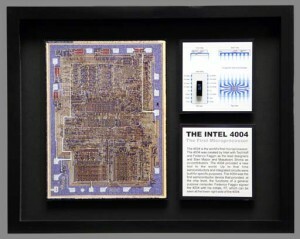 The Intel 4004 – The First Microprocessor – Series 1, 2005 (Framed, 11″x14″): This style of artwork I refer to as my Historical Series. I include an image of the chip, information (on front and back), and the an actual chip. This one is of the Intel 4004 with P4004 chip. The 4004 is the world’s first microprocessor. The 4004 was created by Intel with Ted Hoff and Federico Faggin as the lead designers and Stan Mazor and Masatoshi Shima as co-contributors. The 4004 provided a new tool to the world. Up to that time semiconductors and integrated circuits were built for specific purposes. The 4004 was the first semiconductor device that provided, at the chip level, the functions of a general purpose computer. Federico Faggin signed the 4004 with his initials, FF, which can be seen at the lower right side of the 4004. The 4004 was 1/8th inch wide by 1/6th inch long. This small microprocessor had more computing power than the first electronic computer, the ENIAC, which occupied 3,000 cubic feet and weighed 30 tons.